The Soyuz TMA-18 (No. 228) lifted off to the International Space Station, ISS, on April 2, 2010, onboard the Soyuz-FG rocket from Site 1 in Baikonur Cosmodrome. The spacecraft would remain docked to the outpost until September 2010. In the ISS schedule, the mission was known as 22S. An American and two Russians from Soyuz TMA-18 crew would restore the International Space Station’s Expedition 23 crew to six when they join the Russian, American and Japanese crew members who have been onboard since December. Once united, the first crew to include three Russians at once will continue outfitting the newest modules of the nearly completed outpost, and welcome the last planned shuttle flights and a new docking port. The Expedition 23 and 24 crews, comprising a total of nine residents over a span of eight months, will continue to usher in a new era of scientific research, with some 130 ongoing experiments in human research, biology and biotechnology, physical and materials sciences, technology development, and Earth and space sciences, NASA said. 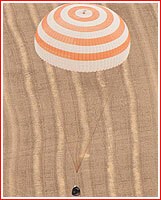 April 4: Soyuz TMA-18 with Expedition 23/24 docks to the Poisk module. April 5: Launch of Discovery on the STS-131/19A mission. April 7: Docking of Discovery to Pressurized Mating Adapter-2. April 15: Undocking of Discovery from Pressurized Mating Adapter-2. April 27: Undocking of the ISS Progress 35 cargo ship from the Pirs Docking Compartment. April 28 Launch of the ISS Progress 37 cargo ship from the Baikonur Cosmodrome, Kazakhstan. May 12: Relocation of the Soyuz TMA-17 (Kotov, Creamer, Noguchi) from the Zarya module’s nadir port to the aft end of the Zvezda Service module to clear the Zarya port for the installation of the Rassvet Mini-Research Module-1. June 16: Launch of the Expedition 24/25 crew (Yurchikhin, Wheelock, Walker) in the Soyuz TMA-19 craft from the Baikonur Cosmodrome in Kazakhstan. June 18: Expedition 24/25 docks to the aft port of the Zvezda Service Module in Soyuz TMA-19. June 22: Relocation of the Soyuz TMA-19 craft (Yurchikhin, Wheelock, Walker) from the aft port of the Zvezda Service Module to the Rassvet module. June 28: Launch of the ISS Progress 38 cargo ship from the Baikonur Cosmodrome in Kazakshtan. June 30: Docking of the ISS Progress 38 cargo ship to the aft end of the Zvezda Service Module. July 8: Spacewalk by Wheelock and Caldwell Dyson in U.S. spacesuits out of the Quest airlock. July 15: 35th anniversary of the start of the Apollo-Soyuz Test Project mission. July 23: Spacewalk by Yurchikhin and Kornienko in Russian Orlan spacesuits out of the Pirs Docking Compartment. July 29: Launch of Endeavour on its final flight on the STS-134/ULF-6 mission. July 31: Docking of Endeavour to Pressurized Mating Adapter-2. Aug. 7: Undocking of Endeavour from Pressurized Mating Adapter-2. Aug. 31: Launch of the ISS Progress 39 cargo craft from the Baikonur Cosmodrome in Kazakhstan. Sept. 2: Docking of the ISS Progress 39 cargo craft to the aft port of the Zvezda Service Module. Sept. 16: Undocking of the Expedition 24 crew (Skvortsov, Kornienko, Caldwell Dyson) in the Soyuz TMA-18 craft from the Poisk module and landing. The Soyuz FG rocket carrying Soyuz TMA-18 spacecraft lifted off from Baikonur Cosmodrome's Site 1 on April 2, 2010, at 08:04:34 Moscow Summer Time. Onboard were NASA astronaut Tracy Caldwell Dyson and Russian cosmonauts Aleksandr Skvortsov and Mikhail Kornienko, all flight engineers on their way to the International Space Station. At the time, Russian cosmonaut and Expedition 23 Commander Oleg Kotov, NASA astronaut T.J. Creamer and Japan Aerospace Exploration Agency astronaut Soichi Noguchi, both flight engineers, were the sole residents on the station, having arrived Dec. 22, 2009, aboard their Soyuz TMA-17 spacecraft. Caldwell Dyson, Skvortsov and Kornienko would join the Expedition 23 crew when they dock to the station on April 4, 2010. The docking with with ISS is scheduled for April 4, 2010, at 09:26 Moscow Time. The Soyuz TMA-18 spacecraft docked to the MIM-2 Poisk module of the International Space Station, ISS, on April 4, 2010, at 09:24:50 Moscow Time. Its three crew members transferred to the station, bringing the total number of people onboard the outpost to six. By the end of its mission, the landing of the Soyuz TMA-18 spacecraft was planned for September 24, 2010, at 08:55 Moscow Time with its original crew including Alexander Skvortsov, Tracy Caldwell Dyson and Mikhail Kornienko onboard. However during the first attempt to undock from the station's MIM-2 (MRM-2) module, an onboard computer had not received a signal about proper hatch closing between two spacecraft. It was despite the fact that all other leak checks were showing that all hatches were reliably sealed. There was another opportunity for landing on September 24, however mission managers had postponed the return for 24 hours, while engineers were studying the reason for an apparently erroneous signal. In the meantime, the crew returned to the station, Russian space agency said. According to NASA, there was an ongoing computer problem onboard the MIM-2 module, particularly with the so-called TVU/Terminal Device. As a result, the command for opening hooks holding two spacecraft had to be issued manually by Aleksandr Skvortsov. When the transfer hatch in the MIM-2 module was closed, "hatch closed" signal was received successfully, but "hatch locked" (or "hatch sealed") command was not. Russian cosmonaut Fedor Yurchikhin remaining onboard the station, then opened and closed the hatch on his side one more time and moved the ratchet to the emergency position. 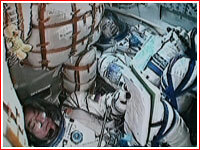 In the next step in preparation for undocking, the space between two hatches was depressurized. This time, sensors on Soyuz and MIM-2 showed different levels of vacuum. After some analysis, mission control in Moscow still gave go ahead for undocking, however without "hatch locked" signal, hooks holding two spacecraft could not be opened. While waiting for a second attempt, Yurchikhin found a seven-tooth sprocket with two missing teeth floating inside the docking mechanism, just behind the hatch. Now it became clear that the dislodgment of the sprocket, with its rod sheared, prevented the "hatch locked" sensor from passing on its status, which in turn kept the hooks from opening. To resolve the problem, a workaround was developed, which included wiring six electrical jumpers enabling to "fake" sealed condition of the hatch for the flight control system. The method allowed successfully open the hooks, clearing the way for the Soyuz TMA-18 departure during the next window on September 25. This temporary jumper wiring was expected to remain in place until the arrival of the next Soyuz, which would deliver a new jumper for permanent use in the system. The Soyuz TMA-18 spacecraft undocked from the station on Sept. 25, 2010, at 06:02:12 Moscow Time, with Skvortsov at the controls. The 261.4-second braking maneuver was scheduled for 08:31:17 Moscow Time (04:31 GMT). The touchdown was expected at 09:22 Moscow Time, 35 kilometers southeast of Arkalyk, Kazakhstan. The landing of Soyuz TMA-18 did take place as planned, at 09:23 Moscow Time (05:23 GMT), according to the Russian mission control. The crew spent 176 days in space. Before his return to Earth, Aleksandr Skvortsov formally transferred duties of the station commander to Douglas H. Wheelock, from the 25th long-duration crew.